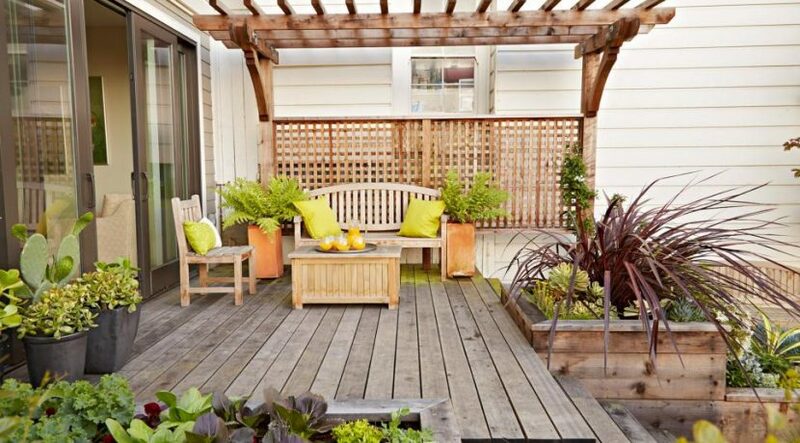 Designing a pattern on the floor is an inexpensive way to tie together the look of your outdoor space. Designer Rachel Greathouse used a diamond pattern with a whitewash to fit the home’s farmhouse chic design. Depending on the pattern and palette, you can end up with a rustic or modern look. Instead of buying new furniture, rehab an old or damaged table with no elbow grease. Just cover it with a vibrant tablecloth. Floor poufs are a low-price way to add seating without investing in larger pieces of furniture, such as a sofa or chaise, say Gabriela Eisenhart and Holly Conlan with WAKE + LOOM Design. While you can find outdoor poufs for less than $50, you also can make your own fabric pouf ottoman in a pattern and palette that you prefer. A garden stool is also an inexpensive, versatile item that can serve as extra seating or a side table. There’s nothing sour about this well-styled patio sofa. In a small space, all you may need are a couple of pillows and accessories. It could be as simple as looking in your fridge. Here, designers Gabriela Eisenhart and Holly Conlan with WAKE + LOOM Design placed lemons in a metal bowl for a burst of color. You can sew a simple outdoor pillow as well. Reclaim an outdoor focal point with upcycled brick and barn doors. The biggest trick is to look for old barns, buildings and chimneys that aren’t being used, suggests Tyler Davis, owner of Athens Building Co., which worked with designer Tami Ramsey of Cloth & Kind on this project. Sometimes you can spot them from country roads. Approach the owner and offer to remove them if they will let you keep the material. You can get free materials and help someone remove a potential hazard from their property. A screen adds coziness to an outdoor area, and this prefab screen is cheaper than a custom one. It’s only on one side of the patio and is topped with a smaller “eyebrow” arbor. St. John Landscapes also saved costs by using low-water, low-maintenance plantings in this award-winning San Francisco backyard project. 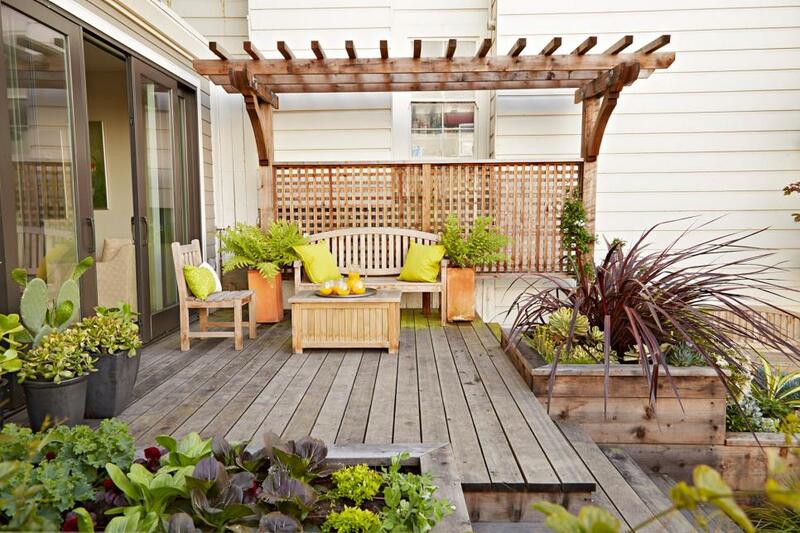 The owners of a San Francisco townhome wanted to be cost effective wherever possible. St. John Landscapes used decomposed granite for the lower patio and paths, which is a cheaper option for a low-maintenance outdoor space. To get the look of this high-end bar cart on a budget, start with a basic metal or wire shelving unit, says Michiel Perry, founder of Black Southern Belle. Spray paint it your desired color. To add the lattice and bamboo trim, use a piece of vinyl diamond lattice, which you often see on outdoor decks and fences. Use bendable PVC pipe that is spray painted to match or in an accent color, for the trim. Adorn your patio or deck fence with festive bunting to make it stand out from the rest, and every day will seem like a party. You can find outdoor pennant-style bunting like this at home decor and party supply shops for about $5-$10, or you can make your own. Cute, cheap updates to a small patio include adding an outdoor pillow in a complementary color to a plastic Adirondack-style chair and an outdoor rug. If you don’t have room for a coffee table, a smaller end table, can serve as your bar when enjoying cocktails with friends. Amy Latta of One Artsy Mama made this table using upcycled crates. If you can’t afford a new farmhouse-style table, the same look can be achieved by mixing salvaged pieces to create your own table. Find an old tabletop, then add old or new spindle legs. If you paint the table and other outdoor furniture all white, it creates a modern and sleek look, says Ili Hidalgo-Nilsson, architect and designer with Terracotta Design Build in Atlanta. Salvage and save money by using reclaimed wood for a barn door. Go big with the doors and embellish the area with a metal star, which can be found on the cheap at antique shops and junk shops.